VietNamNet Bridge – A palanquin parade kicked off the long-awaited Tran Temple Festival on Sunday (March 1) in Nam Dinh Province. Temple traditions: A local man brings a bowl of incense back to the palanquin during a palanquin parade from Pho Minh Pagoda to nearby Tran Temple honouring Tran kings on Sunday. The festival will run until March 6, with a ceremony for distributing papers stamped with the holy royal seals taking place tomorrow night - the first full moon of the lunar new year. The Ngoc Lo palanquin parade honouring Zen master King Tran Nhan Tong (1258-1308) started at Pho Minh Pagoda and ended at the nearby Thien Truong Temple. The custom took place this year for the first time since the early 20th century. The stamps are part of a local tradition dating back to the Tran dynasty (1225-1400), according to researchers at the Viet Nam Culture and Arts Institute. In the past villagers took part in the ceremony to pray for peace, but many of today's worshippers pray for personal fortunes. "The number of security staff is fewer than last year, as the festival has calmed down after problems with crowds in previous years," said Cao Thi Tinh, deputy chairwoman of Nam Dinh City's People's Committee and head of the festival's organising board. "There will be no beggars and small-bank note exchange services. Also, restaurants and hotels have been encouraged to commit not to increase prices during the event." Despite the efforts of hundreds of security staff, the thousands who attended the festival in 2011 and 2013 – including State officials – created a stampede trying to get themselves royal seals. Researcher Nguyen Quoc Tuan, director of the Religions Research Institute, said high-ranking State officials shouldn't attend the event. "I have complained a lot about the fact that high-rank officials attended the stamp distribution ceremony and lured huge crowds," he said. "This is because people believed they would get promotions if they got the stamps. I think the festival belongs to the province, so it should be in charge of organising it properly." Tran Huu Son, director of Lao Cai Culture, Sports and Tourism, said officials should attend them as ordinary people, not to serve a political agenda, Son said. The province has not invited high-ranking State officials to the event this year, Tinh said. Local authorities were working to increase awareness about the real purpose of the stamp-giving ritual. "People who think they can get promotions with the stamps do not understand the festival's traditions," she said. "The stamps are distributed as a wish for luck, wealth and happiness. Ordinary people can ask for the stamps for simple wishes." Another festival honouring the Tran kings will be held tonight at Tran Temple in the northern province of Thai Binh. 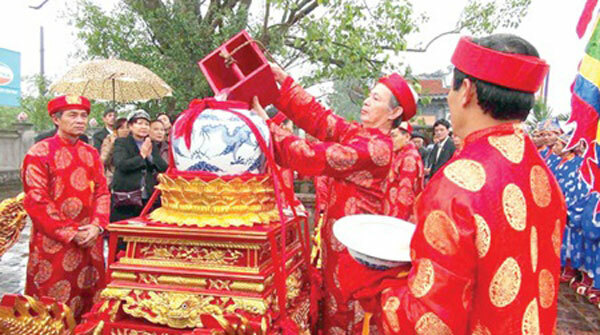 A ceremony dedicated to the Tran Dynasty's ancestor, Tran Kinh, will be organised on March 8, the 18th day of the first lunar month. While Thai Binh is considered the birthplace of the Tran kings' ancestors, the dynasty's first royal palaces were located in Nam Dinh.